Opinion: "Amazon HQ2 will strain New York's spaces and systems"
Amazon HQ2 will only exacerbate New York City's already stretched infrastructure, cramped public spaces and sky-high rents, says Alan G Brake in this Opinion column. Amazon has announced it will locate tens of thousands of high-paying tech jobs in New York City. Instead of swelling urban pride and a sense of opportunity, the company's expansion has prompted well-founded dread of skyrocketing housing costs, overburdened infrastructure, and degraded public space. These fears reflect the already poor conditions New Yorkers face daily as they navigate and inhabit the largest city in the US, and the lack of civic leadership on the part of the city and state's elected officials. By two prominent metrics, New York would seem to be experiencing a period of success and prosperity. According to the Census Bureau, the city's population has swelled to an all time high of 8.6 million, adding 447,565 residents since 2010 – a figure larger than the total population of many mid-sized American cities. Visitor numbers are also continuing to climb, with 68.2 million tourists arriving in 2017, up 2.3 million over the previous year, according to NYC & Company, the city's tourist bureau. While the city is very much in demand, conditions on the ground – experienced daily by the majority of people that actually live here – continue to deteriorate as the result in a multi-front crisis of the public realm. 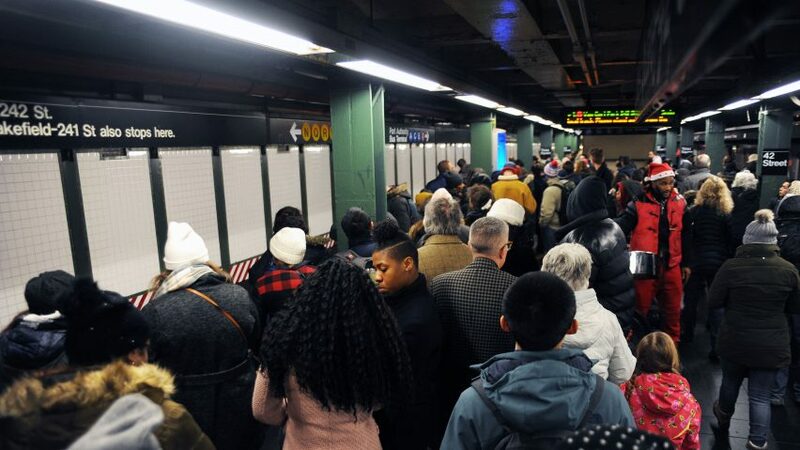 The most glaring crisis largely happening below ground in the city's crippled subway system. It is difficult to overstate the scale of the problem. The subway, the largest of its kind in the world, carries nearly 6 million passengers a day. Over 40 per cent of its trains are delayed by signal problems, track fires, sick passengers, overcrowding, and other problems, sending delays throughout the entire system. The problem, which has been building for years as the result of under-investment in critical maintenance and infrastructure upgrades, reached a crescendo last year, after a series of accidents and extended delays (one sweltering train was stopped for over an hour, earning it the nickname "the hell train"). A constant barrage of outrage – particularly on social media – is directed at the governor, Andrew Cuomo, and to a lesser extent the mayor, Bill de Blasio. The governor controls the agency that runs the subway as well as the state budget that is its primary funder. Cuomo, ever eyeing a presidential run, declared a state of emergency, hired a new head of the agency, and pledged to increase funding to the beleaguered system. Cuomo has proposed provided funding subway repairs by creating a congestion charge for drivers entering much of Manhattan, while de Blasio has proposed a millionaire's tax to raise transit funds. Neither, unfortunately, is likely to happen, and neither politician is spending much political capital to make their plan a reality. Back above ground, conditions aren't much better. A construction boom – primarily luxury housing – is touching almost every corner of the city. An estimated 300 miles of the city's sidewalks are currently under protective metal and plywood canopies, called sidewalk sheds. Intended to shield pedestrians from falling debris, these benevolently named structures have many unintended consequences: they darken the streets; they harm small business by diminishing their visibility; the kill street trees by cutting off rainwater; they create a areas for litter and garbage to collect; they constrict movement on the already overcrowded sidewalks, leading to increasing "pedlock". Often these sidewalk sheds stay up for years at a time, while new structures slowly rise, or while landlords defer maintenance of the facades of their buildings. A bill has been introduced in New York City Council to limit the amount of time these scaffoldings can stand. The powerful Real Estate Board of New York (REBNY), predictably, opposes the bill, and mayor de Blasio, who is close to REBNY, has yet to back it. Adding to diminishment of the city's streetscapes is the increasing number of retail vacancies (exacerbated by the ubiquitous sidewalk sheds, and, of course, by online retailers like Amazon). In some parts of Manhattan, 25 per cent of the storefronts sit empty. Certainly online shopping has had some impact on this figure – retail is irrefutably evolving – but in New York, the main culprit is the price of commercial rents. Beloved restaurants, bookstores, and basic neighbourhood services (bodegas, dry cleaners, hardware stores) shutter with alarming frequency leaving vast stretches – whole city blocks – of darkened storefronts. Many landlords would rather wait for high-priced tenants (often only national chains can afford these rates) rather than negotiate lower rents for independent businesses. Various measures are being proposed to address the problem, such as commercial rent control or a tax on landlords that keep spaces vacant, but little action has been taken to date. In New York – a land of minuscule apartments, often shared with roommates – one spends a disproportionate amount of time in the city's public spaces and so-called "third spaces" (cafes, bars, restaurants, shops), so the degradation of these spaces comes at a greater cost. The rich, in doorman buildings with privatised gyms, pools, social spaces, cosseted in Ubers and private cars, can, as ever, insulate themselves from these on-the-ground urban realities. Amazon HQ2 will bring tens of thousands of new high-wage workers to the Long Island City neighbourhood in Queens, straining spaces and systems on which we all rely. Mayor de Blasio and Governor Cuomo both loudly campaigned for reducing inequality and improving the lives of working- and middle-class New Yorkers. Different in style and temperament, they share a lack of an urban imagination and an understanding that a healthy city with good public space and functioning infrastructure is a more equitable one.